Pole Position may have previously been named RealSports Driving. 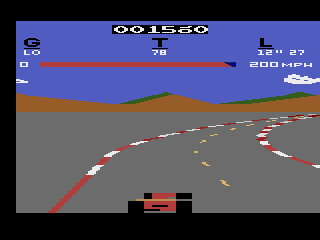 While it may not look like much by today's standards, Pole Position was the one of the pioneers of the modern racing game. Pole Position was one of the choices presented to Bally/Midway from Namco for sublicensing. Bally/Midway chose Mappy while Atari was left with Pole Position which then went on to become the biggest game of 1983. 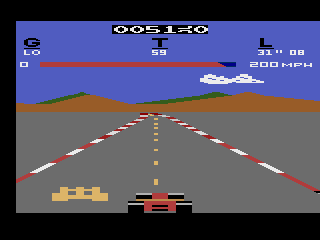 Naturally Atari wanted to port Pole Position to the 2600, but a good deal of technical challenges stood in their way. 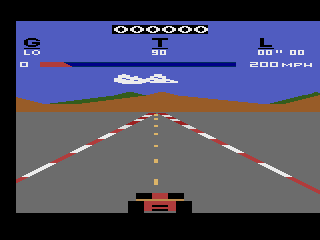 Even though it was made in 1982, Pole Position really isn't all that different from modern day racing games. Sure it may be single player and the graphics may fairly primitive, but the basic concept of weaving your race car in-between other cars still hasn't changed. 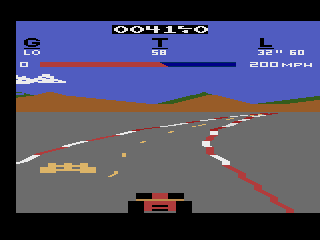 Pole Position was one of the first games to feature advertisements for other games inside the game itself. If you look closely you'll see advertisements for Centipede, Dig Dug, and other Namco/Atari games on the road signs on the sides of the road. Unfortunately these ads couldn't be carried over into the home version due to system limitations. The first thing most people notice is that the road and the grass are both gray. This had to be done due to the way the 2600 sets up the playfield. Making the grass a different color would complicate things, especially since the road is at a diagonal. The road sides were actually drawn using a ball sprite which was stretched to simulate a rectangle, but there was a problem with this method. When both sides of the road meet off in the distance, the ball sprite needed to be drawn in the same place twice. To do this Doug developed a way to reset the CPU in the middle of an instruction, and have it resume in the middle of another (thus drawing both ball sprites in the same spot). Unfortunately one side effect of using a ball sprite for the road sides was that it made the sides of the road look jagged on the turns. The next thing people notice is that the other racers are solid beige and are totally devoid of any detail. No one is quite sure why this is, but it may have something to do with the limitations in the number of players the 2600 can display on the screen. Another minor issue is that the grass is gray in this version (perhaps they paved over it?). This was due to the limitations of the system, as there was no way they could changed colors with all the other complex technical things going on. Still, these are only a minor blemishes on an otherwise amazing game. Apparently Atari had a hard time spelling Pole Position. Carts have been seen with the spelling "Pole Positn*", and with the more humorous "Ploe Position". Why Atari had such trouble is still unknown, but how they got past the quality control department may be the biggest mystery of all. 135-05 Pole Pos. 135-05 Nearly complete with slightly different sounds.